"A spoonful of healthy with a pinch of treats"
Healthy popcorn trail mix is the perfect snack for any event and every taste-bud. Customize yours by making it sweet, salty, or savory. 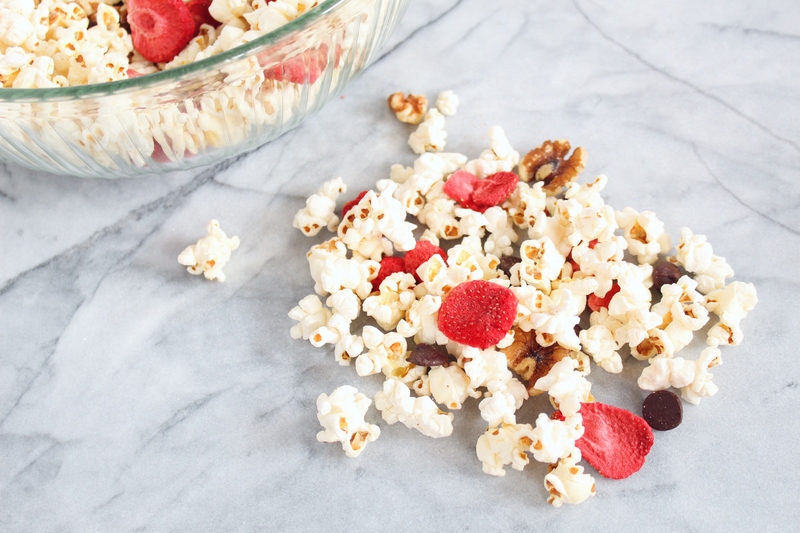 For those of you with a sweet tooth, this popcorn, walnut, dried strawberry, and dark chocolate chip combo is a game changer! Whether you’re headed to the beach, back to school, or ready for football – crunchy snacks are a must! This month, the recipe redux is challenging us to show off our favorite healthy snack recipe with crackle and crunch. Trail mix is my all time favorite snack. I love the mix of chocolate, nuts, and dried fruit. Although, I have to say, popcorn is a close runner up. Adding air popped popcorn to my trail mix was a no brainer. Not only does it add a salty crunch, but it also adds a serving of whole grain and fiber. My healthy popcorn trail mix recipe is so easy to make. I can’t even call it a “recipe”. 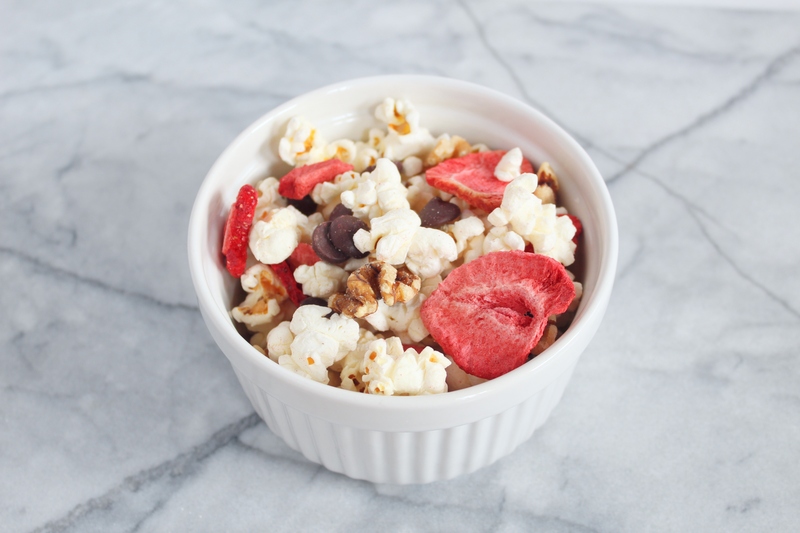 Simply add popcorn, nuts, dried fruit, and your favorite sweet treat to a bowl mix and enjoy! Mix all ingredients in a bowl. Store in an air tight container or gallon sized resealable bag. Pin this simple snack for later! Enter your email address to subscribe to my blog and receive notifications of new posts by email. Yay! !